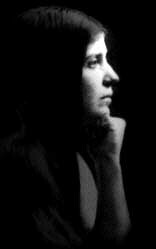 Of all of Aleister Crowley’s priestesses Leila Waddell is without doubt the most intriguing and most popular. Her rare beauty and intellectual prowess inspired Crowley deep within his very soul. Some of Crowley’s best work was inspired by Waddell including The Book of Lies and many wonderful short stories and works of poetry. However, the scope of Leila’s greatness far exceeds her time with Crowley. A few days after I posted this web site I received a letter from a gentleman who explained that he had some interesting information on Leila and would be willing to share it with me.This proved to be quite true. The following information is from the text of one of the documents that he shared with me. Leila Ida Nerissa Bathurst Waddell was the daughter of Mr. And Mrs. David Waddell of Bathurst and Randwick. 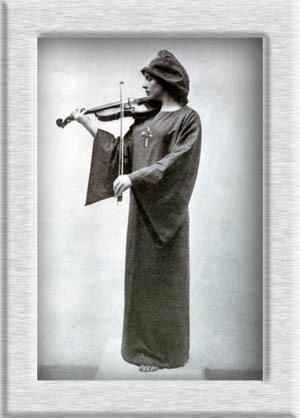 She was an accomplished violin and orchestral player. Her first professional appearance was at the concert recitals given by Organist Arthur Mason. In 1906 her services in the cause of charity and her high personal character were recognized by a concert in her honor. This led to her engagement by Henry Hayward with a concert party from Europe known as “The Brescians” which toured Australia and New Zealand. In 1908 Leila left Australia to try her art in England. Her principle experience there was the leader of the Gypsy band in the stage performance of “A Waltz Dream” at Daly’s London Theatre. This gave her an impetus in a new direction and in the character of “The Ragged Gypsy” she appeared with a group of female violinists during a period of years at the coliseum, The Palladium and other theatres and ultimately toured France and Germany as well as other countries as far as Russia. Leila later went to America where she filled many engagements which took her to all the greatest centers. In Los Angeles California she contributed to short stories and articles on music. This literary work attracted attention in New York where she published in the magazine “Shadow Land”: an article titled “Two Anzacs Meet in London”, which was so well noticed that she could have easily entered upon a new career. Due to the failing health of her Father she returned to Sydney Australia after an absence of fifteen years. In Sydney she made appearances with the Conservatorium Orchestra and with the Royal Philharmonic Society of Sydney. On Tuesday September 13, 1932 Leila Waddell died from Uterine Cancer at the young age of 52.